Research papers on active listening examine the communication technique often employed by professionals in the counseling or conflict resolution fields. Active listening is a communication technique often employed by professionals in the counseling or conflict resolution fields. Essentially, active listening requires the person to repeat back what they just heard said, paraphrasing in their own words in order that correct meaning has been understood. Active listening techniques can help anyone improve the retention of what they hear, as well as improve their understanding of basic communication. Scientists have discovered that the average person retains only between 25 and 50 percent of what they hear. This inability to retain information can affect one’s personal or professional life. For example, if one only remembers one quarter of something a boss has said, serious problems can result. 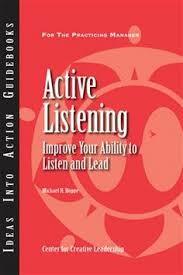 Active listening, as a part of good communication skills, requires higher levels of self-awareness. A person must make a conscious effort in order to hear, not just what the other person is saying, but the entire meaning of their verbal communication. The key to active listening is to pay attention to whomever is speaking. Many people, when engaged in conversation, are simply waiting for their turn to speak, often rehearsing their points in their own head while others are speaking. This is the opposite of active listening, and may lead to conflict or at the very least, misunderstanding. One way to let others know that you are engaging in active listening is repeating what you believe was just said. Communication Skills - Communication Skills projects identify the top two points of communication that are considered significant, in need of training, and necessary for a school leader. Importance of Marriage - Importance of Marriage research papers examine the importance of the institution of marriage by way of historical, social, and economic research. Learning Skills - Research papers on learning skills discuss one of the most valuable services that any teacher can provide their students to propagate lifelong learning and critical thinking. Nonverbal Communication - Nonverbal Communication research papers examine the many ways in which people communicate without speech. Barriers to Effective Communication - An individual with hearing loss, for example, may not be able to hear a verbal communication effectively. Nonverbal Learning Disorder - Individuals with NVLD misunderstand non-verbal communications, and are often unable to respond correctly. Style of Interpersonal Communication - Style of Interpersonal Communication research papers examine how the interpersonal communication concepts and the interpersonal relationships influence the development of communication style. Intercultural Communication - Intercultural Communication research papers examine the aspects of interpersonal communications in business and in dealing with the global economy. Paper Masters writes custom research papers on active listening examine the communication technique often employed by professionals in the counseling or conflict resolution fields.